It has never been widely accepted to be anything but what Society deems we should be, being different is not the norm. As a teen and young adult, I tried so hard to be the same, but it felt so unfamiliar and terribly unnatural. I felt like I was wearing a jacket that was far too small, the material made me scratch and the colour was my least favourite (metaphorically speaking). This jacket was a hand me down, it really didn’t belong to me in the first place and I felt more out of place wearing it, than I did when I wasn’t. Although, I do admit, I squeezed into it everyday of my life for a very long time, because I was conditioned to believe that I had no right to express my ‘difference’ and I should just try to be the same and put up with it. I got rid of that coat eventually a few years ago, it was the best decision I have made for myself. I was born to be different, I chose this challenge before I came into this life experience. Suppressing this promise I made to myself for such a long time, didn’t serve me well. That coat I wore, the one that was far too small, stunted my growth and kept me from extending my arms to the people, places and things that would have helped me to be ok with being different. I allowed that jacket to hug tightly to the same old, and I was so unhappy. Now I lovingly accept that I am not the same, I don’t want to be something that I am not and in the past 6 years I have fought my way out of that hideous jacket, what a battle it has been. I am who I am, I am who I am, I am who I am, this is my mantra. All of what makes me who I am, I really love about me. I am not faultless or flawless, exemplary, or the best, I am who I am, I am just me. Finding my way to the me of who I am, took a lot of Soul work. A process that was very painful indeed. What kept me going was the promise I made to myself before I was born, that if I found my way to my soul, then perhaps I would inspire other people to find their way to their soul too. This has been my purpose, this has been the sacrifice, and there have been many of those. The stress, the agony, every decision, the tears, the losses, the heartache, and fighting the urge to give up, has been worth it, because what I have gained the most from walking this path, is being able to hold onto the courage of wanting to just be me and nothing else. There are many that don’t get who I am, many who judge and those that won’t accept; to those of you I send compassion and hope. Hope because maybe someday you will find your way to yourself as well. 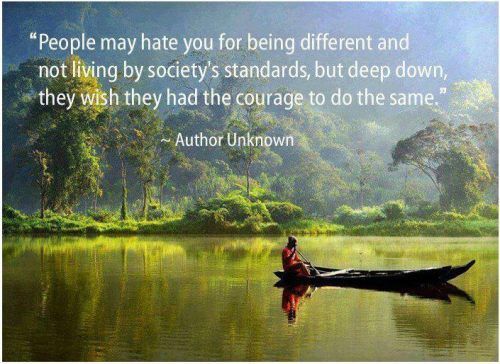 Be your own different and embrace the courage to stand in it, just like I do. To the people I love, and there are many, Satya, May You Find Truth.